Today’s “Card of the Day” features a stabby shade and the stronkest Skeleton in existence (praise Mike). 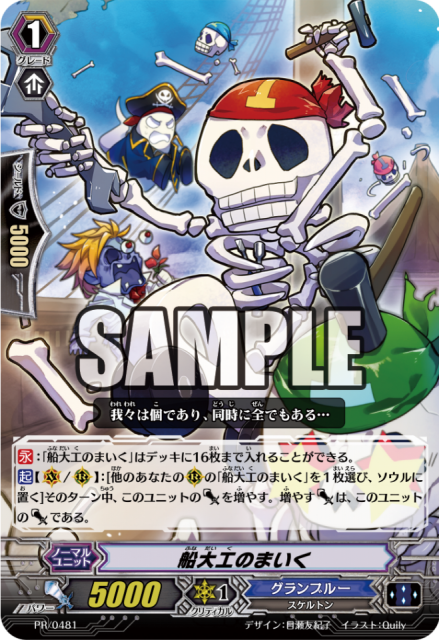 [AUTO](RC):[Put this unit into your soul] When your vanguard attacks, if you have a vanguard with “Nightrose” in its card name, you may pay the cost. If you do, draw a card, choose one of your vanguards, and it gets [Power] +5000 until end of that battle. [AUTO](VC):[Counter-Blast 3 & Soul-Blast 3] At the beginning of your main phase, you may pay the cost. If you do, search your deck, soul, drop zone, or damage zone for up to one card each, choose three cards from among them, call them to separate (RC), and shuffle your deck. [CONT]:You may have up to sixteen cards named “Great Skipper, Mike” in a deck. [Power] until end of turn. The [Power] increased by this effect is its current [Power].